The Gamma Bucket-O-Balls contains 48 Pressureless Practice Balls in a re-useable all-weather plastic bucket for storage in any condition. 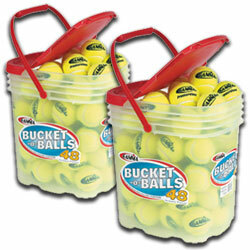 The Bucket-O-Balls is a very popular item among teaching pro�s, students and avid players. You will receive 2 buckets of pressureless balls.